Since we now have accurate Memory I decided to add cheat support again. I updated the old cheat PR and fixed a lot of stuff that PR had. For now I also removed the possibility to add/edit/delete cheats from the PR. It had multiple race conditions in the old PR and is something that can be properly added by a follow up PR. Cheats that are currently supported are Gateway cheats. Other formats like ntr plugins could follow. Thus there is a CheatBase class and all other cheat formats will get derived from that base. I tested it with some games and some cheats. Not all of them worked but I would guess that is due to a wrong version of the game or faulty cheat codes in general. It would probably a good idea if we host our own cheat db. Maybe in the future we could also add a way that cheats will get downloaded from our web-services. 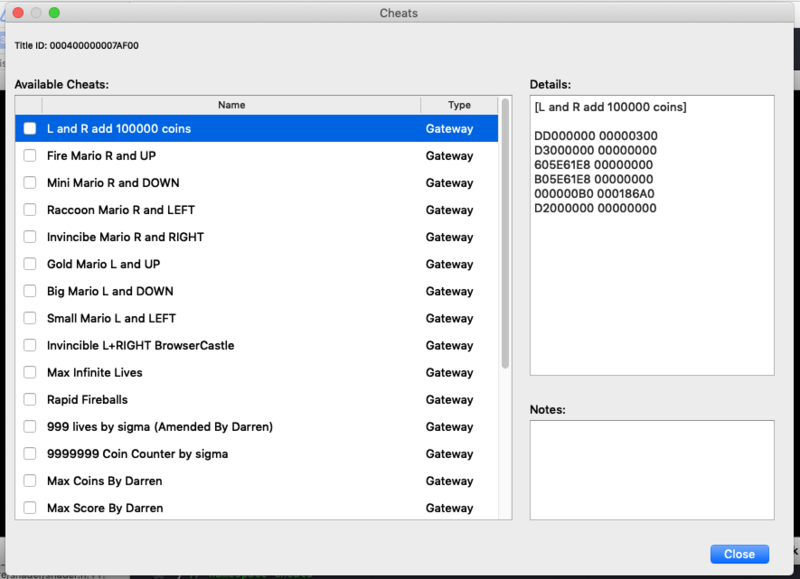 One issue @wwylele noticed: Cheats uses Write32 etc which accesses the memory of the current process. This could lead to issues if the current process is e.g. an applet/home-menu. I didn't observe any issues yet, but the fix would be to add Write functions that get the process as an argument. we don't have those functions yet and I would prefer to add them in a separate PR if necessary. All cheats are executed every tick frame? I tested it with some games and some cheats. Not all of them worked but I would guess that is due to a wrong version of the game or faulty cheat codes in general. Note that it wasn't guaranteed that my last PR resolved all memory inconsistency issue (it was rather a by-product that it happens to fix some). Specifically, when debugging the PR I noticed that some games (mistakenly?) use svcGetProcessInfo to determine the used memory amount and allocate memory according to it. As svcGetProcessInforeturns a slightly larger number than occupied APP region memory, which we doesn't accurately emulate, game would allocate a different amount of memory in citra and every client-side allocation growing from the end would get an offset. Example: super smash bros. I have some questions below. It would be helpful of you to answer them. Thanks! I think it might be better to do line.value & 0xFFFF for the static_cast<u16>(line.value), just to be clear. what about nested loops? I think your code isn't handling this correctly as you are only holding a single loopbackline. Just found an additional (and probably rather critical) issue when I was testing some cheats. This is looking much cleaner! However there still seem to be some issues with cheat code interpretation. Hope you can look at them. @jroweboy might have some comments regarding the UI though. As real HID shouldn't need to maintain an extra state and this can be surprising to a first-time code reader, please add a comment stating that this is made specifically for cheat engine to read, and is not intended for other purpose. Can I have a list of current state/TODO/roadmap? For example, how many games are tested, what outstanding issues are there, and what is the general idea of further UI design? And do you expect this to be merge soon? State: Imo ready to merge, We tested a lot of cheats for a lot of games. Most worked. Some didn't (but the same happened on a real 3DS) and some games (like Smash) just don't work at all. Probably caused by still inaccurate memory. As this is already a function template, you could parametrize the type of callable write_func for less overhead, just like how standard library does for those function param in <algorithm>. Same for other similar functions below.